Edward Noble was born in 1846, at Penrith, Cumbria, the son of Joseph Noble, a grocer. His mother, who at this moment in time shall have to remain unidentified, died when Edward was young. In the Census of 1851 for Penrith, the household consisted of Joseph, aged 32; Edward, 4; and a sister Rachel, aged 3. Not much is known about Edward's early years, and we must jump into the 1860's to find him next: at Liverpool. Quite what made Edward and his father move to Liverpool is not known, but at some point he had found work as an engineer at sea. Whilst in Liverpool, Edward met Jane Ann Davies of Corwen, Merionethshire. They were married at Bala in 1870, and soon after the couple moved to Corwen where Jane's family still lived. In the summer of 1871 a daughter, Annie Mary, was born. Sometime in late 1871, early 1872, Edward and Jane Ann, together with Annie Mary and Joseph, moved to Carnarvon. 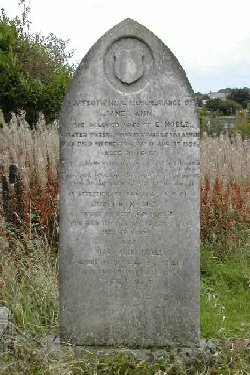 Probably motivated by Jane Ann's family, who were mostly involved in the licensing trade*, he took over the Patent Slip Vaults at Turkey Shore from Hugh Williams. 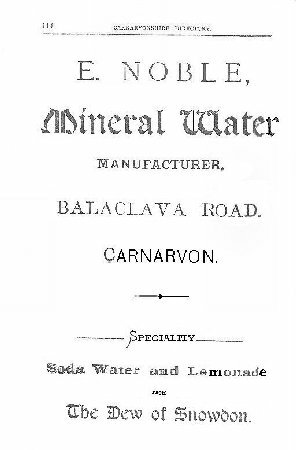 In 1874 he set up in business as a "Mineral Water Manufacturer and Ice Merchant", the factory being located at 8 Turkey Shore, very near to the Patent Slip, on the corner of Vinegar Hill. The business was known rather grandly as "E. Noble's Soda Waterworks & Wenham Lake Ice Stores". "John Watkins, Ruabon, was summoned for drunkenness and for assaulting Mr. E. Noble, landlord of the Patent Slip Vaults, on Christmas Day. Fined 2s. 6d. and costs for drunkenness and 5s. and costs for the assault". William Rees, who had been fined for being drunk, was charged with having assaulted Mrs. Jane Noble, at the Patent Slip public house, on Saturday night. The complainant stated that the defendant went into the house about eight o'clock. He was boasting how he could fight some men at Penygroes, when her husband told him to make less noise. Upon that the defendant asked her husband what he had to do with it, and said that he would 'soon make his face into a pound of beef steaks.' Her husband then went for the police, and during his absence, on her again telling the defendant to be quiet, he struck her in the face, and then left the house. The defendant said he came from Merthyr Tydvil, and had had nothing to eat. He had a glass of ale or two in the complainant's house, and very soon went drunk on it. The complainant exasperated him by telling him to go back to Merthyr Tydvil to starve again. The complainant said that the defendant was in the house about an hour. He had two or three glasses of ale, but was not drunk. He was committed to gaol for fourteen days, and ordered to pay the costs." "Mr. Allanson applied on behalf of Mr. Noble, Patent Slip, for a transfer of the beer licence belonging to Mr. Harwood, to No. 5 Mount Pleasant. The application was granted". "Mr. Allanson made an application on behalf of Mr. Noble, Patent Slip Vaults, for a full licence for the latter premises (Mount Pleasant Vaults). The present licence would not allow Mr. Noble to sell small quantities of liquor. 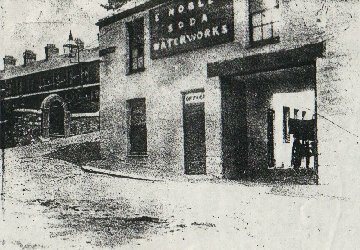 No drink was sold on the premises, and Mr. Noble, together with Mr. Harwood, the owner of the property, would give a bona fide guarantee undertaking not to sell on the premises with the full licence, if granted, but merely to accommodate the public by selling both in large and small quantities. Mr. Harwood would also undertake to apply for a six days' licence for the Twthill Hotel, which is situated opposite the premises now held by Mr. Noble, provided that the bench would grant a full licence to the latter premises. Deputy Chief Constable Prothero objected to the application on the ground that Mr. Noble was not the bona fide tenant, he did not reside on the premises, also that the place was too small, that there was no conveniences whatever attached to it. Mr. Prothero informed the bench that Mr. Harwood's lease of the Twthill Vaults would shortly expire. The bench declined to grant the application." "The application of Mr. H. Harwood to have the licence of the Mount Pleasant Vaults, to sell off the premises only, transferred to him from Mr. Noble, was granted." "This week, in the garden of Mr. E. Noble, soda water works, at North Road, a number of fine mushrooms were found upon the ground being turned up. On Sunday last a person in the town found two fine butterflies in his bedroom. These must be signs of the mildness of the season." Dinas Dinlle is so well known to pleasure seekers from Carnarvon that they will be glad to learn that Mr. E. Noble, whose name is associated with 'soda water', 'lemonade' and 'ice', has erected a temporary building at the foot of Dinas Hill, where 'the weary and worn' may find refreshments of all kinds, but no intoxicants. We learn that this 'noble' enterprise has met with great success." 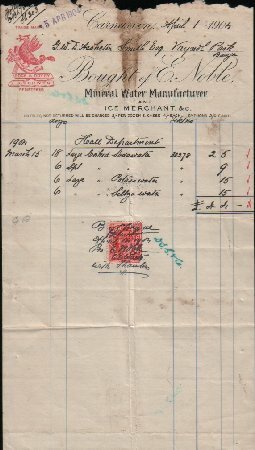 A Noble's receipt, dated 1st. April 1904. "The inhabitants of Rhyd-ddu were greatly startled last week in observing an encampment on the shores of their lake. During the first day (Tuesday), a policeman was seen to visit the spot, and the tents, which merely added to their curiosity. In course of Wednesday, the encampment party was seen to sally forth with guns, which added to the terror of the children who had kept a close watch upon the encampment. The Rhyd-dduites were told that the party was a reconnoitering military party sent to guard the famous pass of Rhyd-ddu. At last, Mr. W. W. Jones, Quellyn Arms Hotel, in company of Mr. Roberts, of the Snowdon Quarry, ventured to the neighbourhood of the military tents and were agreeably surprised to find the leaders of 'the military' party were no other than Mr. Harwood, Penrhyn Villa, Mr. Noble, the celebrated soda water manufacturer and ice merchant, and Mr. Griffith, Coach and Horses, Bethesda, who had gone for a week's encamping and shooting in that beautiful district." At 4 o'clock on Tuesday morning, Mr. E. Noble, aerated water works, awoke in bed to find his residence, at Patent Slip, full of thick and smothering smoke. He at once raised an alarm in the house. It was afterwards found that the bar was on fire, and that the woodwork had been considerably scorched. The fire was soon put out and that without the necessity of summoning the brigade. After searching the place, it is conjectured that the fire must have been dropped, before closing hours, into some sawdust on the outside of the bar, and that this had smouldered for hours till it burned the flooring and began setting the bar in flames. It was a most fortunate circumstance that the inmates were not completely overcome with the dense smoke. The premises, fortunately, are partly insured." Three weeks later, on Tuesday the 3rd. of March, Joseph Noble died at Victoria Street, Carnarvon, aged 69. He was buried with his daughter-in-law Jane Ann at Llanbeblig. Life seems to have taken a turn for the better for Edward after the death of his father, and the Herald Cymraeg announced in November 1887 that at the age of 41, he had married for the second time. His new bride was one Mary Ellen Jones, at 26** fifteen years his junior, and the daughter of the late William Jones, Baker, of 11 Victoria Street. The marriage took place on the 9th. of November, at Christ Church. One of the witnesses was J. P. Gregory, Painter & Plumber, of Market Street and Greengate Street. On the 12th. November 1893, his first son, Edward, was born at Pennant Vila, Uxbridge Square. He was followed on the 21st. of February 1896 by William John; the 22nd. of April 1899 Ernest Joseph; and on the 25th. of December 1901 by George Graham. The last three boys were all born at the Patent Slip Vaults. In 1899 Edward's daughter, Annie Mary, married Army Captain William Edward Jenkins at Falmouth, Cornwall. Up to now I have been unable to find any trace of the couple in the 1901 Census, and it is not until 1906 that they appear in Carnarvon. On the 4th. of January that year, at 5 Priory Terrace, Annie Mary gave birth to twins: Jennie, born at 3.00 p.m., and Edward following at 3.10 p.m. It seems that Edward was content with his life and family by now. He appears to have been quite a benefactor to various children's groups. The Herald reports in their edition of 22nd of January 1910 that he donated an undisclosed sum to the Children's Fancy Dress Fund. 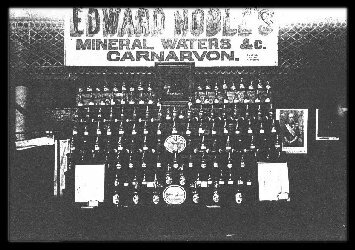 His grandson, Mr. E. Graham Noble, revealed that his father (Edward Junior) played a large part in the formation of the first Scouts group in Carnarvon in 1908, and his grandfather later allowed them to hold their meetings in an old cellar at the Patent Slip Vaults. Edward's life was turned upside-down once more on the 31st. of December 1910, when Mary Ellen died, aged 47. She was buried on the 3rd. of January 1911 with Jane Ann and Joseph. The death took place on Wednesday afternoon of Mr. Noble of the Patent Slip, in his 72nd. year. ** Mr. Noble was the licensee of the Patent Slip Inn for about forty two years. The funeral (private) will take place tomorrow (Saturday)." The funeral took place at Llanbeblig churchyard, on Saturday, of the late Mr. Edward Noble, Patent Slip Vaults, who died the previous Wednesday, in his 72nd. year. The Rev. J. W. Wynne Jones M. A. officiated. The principal mourners were:- Messrs. Edward Noble, William John Noble, Ernest Joseph Noble, George Graham Noble, (sons), Mrs. Jenkins, (daughter), Messrs. William Edward Jenkins, (grandson), D. Jones, Victoria Street, (brother in law), William Jones, Clynnog, (brother in law), R. Norris, Twthill Hotel, E. Griffiths, Eagles Hotel, W. Jones, Marcus Street, and Miss Jane Jones, (sister in law). Wreaths were sent by the following:- Sons and daughter, Cissie and Mother, Maggie Howard, Mrs. Parry and family, Bridge Street, and Grace Ann Cartwell. The undertakers were Messrs. C. and W. Land". The Patent Slip Vaults were advertised for sale in the Herald in February 1914. When War broke out, three of Edward's sons joined up, and with their absence, the Soda Water Works closed down, ending forty years of trading. A sad epilogue to Edward Noble's life came three months after his death, when his granddaughter Jennie died on the 12th. of April, at the tender age of 8. She was buried with her grandparents, step-grandmother, and great grandfather at Llanbeblig. 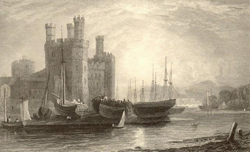 Her parents, together with her brother Edward, left the area, settling in Barry, South Wales. *A number of Jane Ann Davies' family came to live in the town. 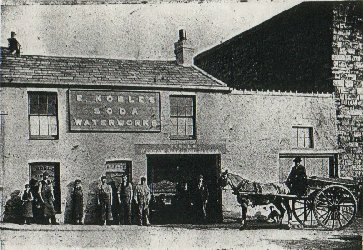 One of the public houses they ran was the Railway Inn, 2 North Road. 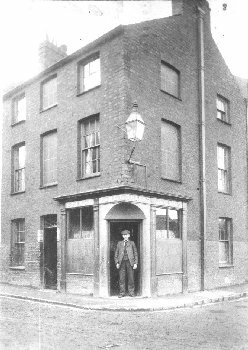 By December 1876 her brother Herbert H. Davies was the licensee. In January 1880 the licence was transferred to Henry Harwood, a Londoner, who was married to Jane's sister Catherine. By the time of the 1881 Census, her mother Ann ran the house. Also listed in the same census at the Railway was another sister, Emma Griffith, who was the wife of Edward Griffith, landlord of the Eagles Hotel, which was owned by Harry Harwood. Another sibling, brother Isaac, was the landlord of the Rhyddallt Inn at Llanrug, a few miles outside Carnarvon on the Llanberis road. **Mary Ellen's age seems to have been upped slightly, possibly because of the large age gap between her and Edward. Taking into account her age at death, and census returns, her real age should have been 23. Meanwhile, Edward's age as reported at his death, and also recorded on his gravestone, was also incorrect. He was really 68. This is borne out by his age on the marriage certificate and also on every census return found. Many thanks to Mr. E. Graham Noble for sharing some of his extensive research into his family history. 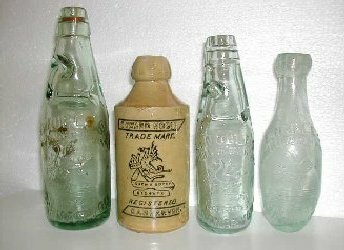 If anybody has any other photographs, advertising, bottles etc., I would be pleased to hear from you. I am still interested in finding out who Edward Noble's mother was, as well as finding Edward and his father on the 1861 & 1871 census returns. If you can help please get in touch. My email address is on the Contact Page.